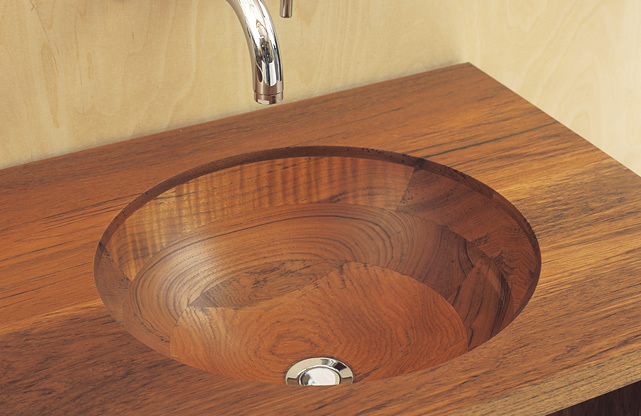 Why choose a wood basin? A wood basin is a departure from the norm and this can be enough reason for many, but many may have doubts about wood’s suitability for the task. Wood is regularly used in furniture as well as a flooring material, but for some items, particularly those involving water, it is often looked on as a poor choice. Some woods are indeed not a good fit, but there are many that are great in such uses, requiring only minimal treatment. Woods such as teak are tough and resistant to chemical attack. There are limits as some cleaning agents, particularly those containing bleach, may cause discoloration, but these limits are easily avoided. The addition of wood to the possible materials adds new possibilities in looks and shape. There are a number of different locations you may be considering a new basin in and there are often different reasons you may consider including a wood basin rather than one of a more traditional material. For a separate lavatory, a basin is one of the few items that you have the opportunity to make a visual statement with. Usually in such a room, there is only the basin and a toilet and potentially some storage for the cleaning equipment. In a modern contemporary design, where things are often more minimalistic, this is even more true. Having an attractive basin to wash your hands in can make all the difference, aesthetically, to such a room. A simple idea here is to place your basin on a marble or granite surface and potentially have a storage space bellow that not only allows concealment of cleaning equipment, but also conceals the pipes for the basin. On occasion, people might desire a sink in a bedroom, especially a bedroom without an en-suite in a house with limited bathrooms. In this case, it’ll often be that the materials traditionally associated with sinks just don’t look right with many styles, especially if the bed and other furniture are themselves wooden. There are sinks that can blend in, or become a feature in their own right. Kitchens are a place many have pride in, but the sink is often a part that’s left out. Kitchen sinks, unlike those in bathrooms, are much harder to get in designs that aren’t utilitarian. A wood basin/sink in the kitchen can either be used to compliment a wooden kitchen style, or provide a pleasing contrast to brighten up a kitchen feature more often chosen for function over form. As oft repeated in this blog, form and function can go hand in hand, they are not mutually exclusive. Bathrooms and shower-rooms are places where sinks are almost universally found and given the amount of time many will spend there, they can be forgotten as something to express your taste with. Here there is possibly the most leeway to express yourself and the versatility of wood makes this a lot easier. His and hers sinks can be made and unlike most on the market, there is plenty of scope for different choices to be made between the two, or added personalized touches, while still keeping the two linked in style. Or you could be adding a wood basin to compliment a wooden bath, to keep the style consistent.